Community members march to Evergreen Cemetery. Photo by Nikolasi Saafi. Over 100 painted faces walk along Pacific Avenue, some in bright dresses with hair full of orange marigolds. Fe Silva-Robles, program director for Senderos, carries a bowl of smoking copal, followed by banners, trumpets and drums. 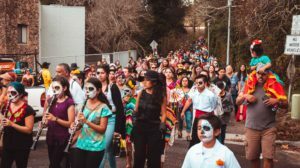 Their journey began on Nov. 3 at the Museum of Art and History (MAH), continued to the Santa Cruz Mission and ended at the Evergreen Cemetery with commemorations for Día de los Muertos. 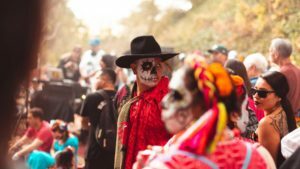 Día de los Muertos is a Mexican holiday celebrated from Oct. 31-Nov. 2. Each day carries significance and honors a different deceased relative. This procession to the cemetery to commemorate the dead through gatherings and offerings is a fusion of Aztec and Catholic beliefs. During the holiday families create ofrendas, or altars, to remember the life of loved ones through photos and gifts. Families come together to cook the dead’s favorite food while re-telling stories of their past. A man in calavera face paint looking around the Evergreen Cemetery gathering. Photo by Nikolasi Saafi. Senderos is a nonprofit that provides educational and recreational programs for the Latinx community in Santa Cruz County. Through events like Día de los Muertos, Senderos celebrates and shares Latinx culture with all types of people. Helen Aldana, the intercultural programs coordinator at the MAH, worked with Senderos to organize the last two Día de los Muertos events. Anyone interested in the event was welcome to join — the environment was cheerful and celebratory. The event started with a festival at the MAH where families enjoyed face painting and paper flower making. Mexican music played in Abbot Square as school children performed dances dressed in traditional trajes, masks and hats. Ashley Holmes, the market and brand catalyst for MAH, organized volunteers for different arts and crafts booths. At about 2 p.m., everyone got to their feet and joined the procession toward Santa Cruz Mission, following Fe Silva-Robles. The procession stopped beside the Mission as they watched baile folklorico dancers spinning in bright dresses. The crowd continued from the mission and arrived at the cemetery, passing by dozens of marigolds and calaveras placed on the graves. Silva-Robles rested the smoking bowl of copal on an altar among photos, a Virgin Mary and pan de muerto. Men in devil masks and chaps began to dance and whip the ground. 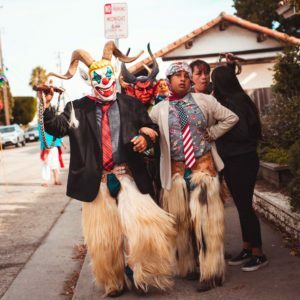 Día de los Muertos is a remembrance of history and a celebration of identity which continues on in Santa Cruz.